This is one of the Gnome Press titles that I didn’t expect to get for a long time, and certainly not at this price. Essentially it is the same as the regular edition except in a couple of cosmetic respects. You can find the Close Up for the regular edition here, and if you’re interested in the contents you can also check out the Review. The obvious differences are in the binding. The Limited Edition is bound in crimson boards with gold lettering and a black spine. The top of the block is also blackened. The other difference is of course the text proclaiming the limited nature of this book. Lets take a look. Not in as nice a condition as my regular copy, but ok nonetheless. Taken a bit if a ding about halfway down the spine at some point as you can see. Now we’ll compare the bindings. 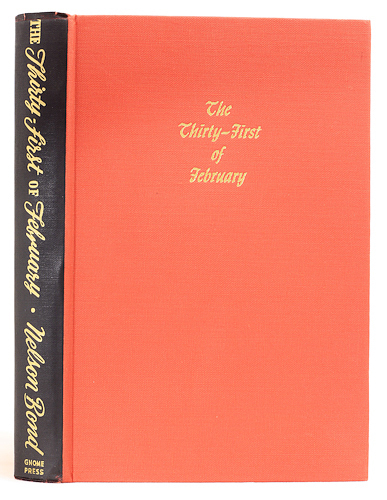 First the regular edition in it’s burgundy cloth, and then the limited binding. Very nice. I normally do the rest of the Close Up with the jacket on, but the jacket is of little interest here as it’s identical to that of the regular edition. Lets continue. Note the blacked top of the block. There’s a little damage to the head of the spine – it’s quite brittle at that point. We’ll close out by looking at the signature page. I have copy number 78. Note the “…of which one hundred are for sale.” statement. The remaining twelve were taken by Nelson Bond himself and are different again. Those twelve copies have no dust jacket and are presented in a slipcase. I (still I hope..) have one earmarked for me when I get around to paying for it. Binding: Currey priority (A). Crimson cloth, black spine with gold lettering on spine and cover. Blackened top of the block. 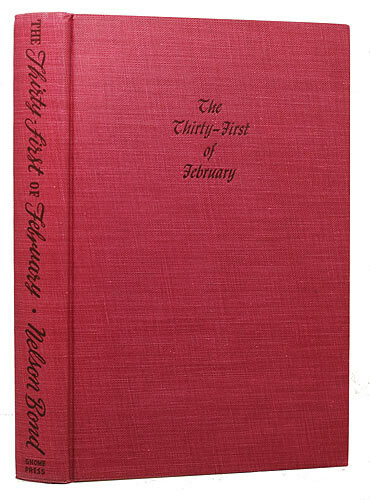 Chalker & Owings: THE THIRTY–FIRST OF FEBRUARY, by Nelson Bond, 1949, pp.272, $3.00. 5000 copies printed, of which half were hardbound on printing, the rest paperbound in trade format for Armed Forces distribution a year or so later at $1.00. An additional 112 copies were signed and numbered on tip-in sheet with spine blackened, gold titling, in black cardboard slipcase, $5.00. The 112 copy fancy edition, the only one Gnome did, was done at Bond’s request. Although it is basically a kludge and uses the regular edition, there was an attempt to give it the “look” of Bond’s special limited version of Exiles of Time (Prime Press). Bond, who had a bookstore of his own in Roanoke, VA, reportedly took and sold almost all of the special himself. We’ve seen only one of the specials offered for sale in over 25 years, and we bought it. 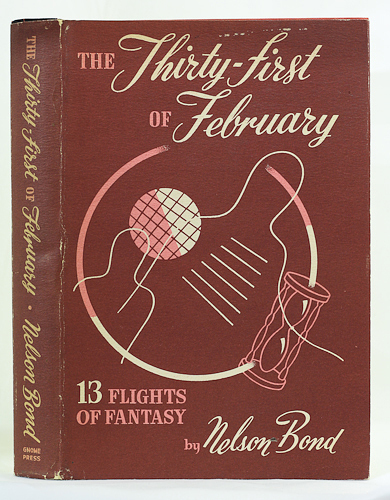 Currey: THE THIRTY-FIRST OF FEBRUARY. New York: Gnome Press, . Two issues, no priority: (A) Crimson cloth, lettered in gold on spine panel and front cover, spine panel and top edge of text block stained black. 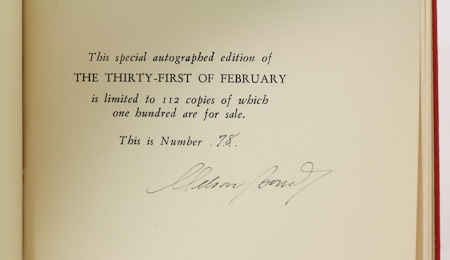 112 numbered copies signed by the author. 12 copies reserved for use of the author were enclosed in paper slipcase and apparently issued without dust jacket. 100 copies for sale were issued in dust jacket and apparently some if not most were issued without the paper slipcase. Limited issue. (B) Magenta cloth lettered in black. Trade issue. First edition so stated on copyright page. Note: Reprinted circa 1952 in paper wrappers for distribution to US military personnel. Although a later printing, the first edition statement is retained on the copyright page. Comments: In any condition, this is a great addition to a Gnome Press collection. Especially so at only $52. I am ecstatic to have it. Chalker & Owings miss what is mentioned by Currey regarding the special presentation of the 100 vs. the 12. A discrepancy in the Currey description above as I pointed out in the Close Up of the regular edition is the color of the cloth and the lettering. Currey claims magenta cloth with black lettering for the regular edition, but obviously you can see it’s burgundy with darker burgundy lettering. This entry was posted on June 19, 2011 at 12:20 am and is filed under 1949, Close Up with tags James Gibson, Nelson Bond. You can follow any responses to this entry through the RSS 2.0 feed. You can leave a response, or trackback from your own site. ..aaaand, just to muddy the waters further, my copy of the limited edition, which I bought from the author’s catalog back in 1981, is numbered #29, has a jacket but comes in a black paper-over-boards slipcase. Said slipcase has no label or marking of any sort and so may not be original–but it’s just the right size for the book, and Bond mentioned it without comment in his catalog entry. Could he have slipcased more than just the dozen he took off the top? Or maybe mine is an extra one that he had lying around?